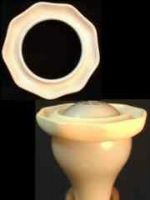 The ceramic lamp ring is 3 3/8 inches in diameter and 1/2 inch high. Oil in the trough is heated by the light bulb to disperse the fragrance. Using an eye dropper, add a few drops of your favorite oil to the ring and place on your lamp's bulb. When bulb gets warm the fragrance will disperse throughout the room! *Note: Only use with 60 watt bulb or less.